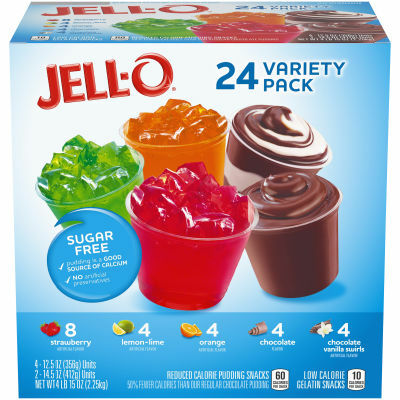 Sugar-Free Gelatin and Pudding Snack Variety Pack - Jell-O Sugar-Free Gelatin and Pudding Snacks deliver the same great flavor but in a low calorie choice. Offering a selection of popular flavors, this tasty variety pack includes|8 Strawberry, 4 Lemon Lime and 4 Orange low calorie gelatin snacks and 4 Chocolate and 4 Chocolate Vanilla Swirls reduced calorie pudding snacks. Satisfy Your Snack Craving - A perfect choice at home or as a tasty on-the-go treat you can savor anytime, Jell-O snack cups are quick and easy to pack and take with you. Grab one for a quick dessert fix at home, work or school. Scrumptious Jell-O gelatin and pudding cups are a fun and convenient treat for adults and kids alike. Serving size 1 snack (89 g) (for Gelatin column).